Health seekers regularly get hooked into new health fads, often ones simply recycled to each new generation of potential audiences. With the emergence of each new fad, new books are written, websites appear and products are hawked. This ultimately is followed by much disappointment. Candida or Yeast is one of these deceptive health fads from which we can learn important lessons. In the 70’s one of the big health headlines was hypoglycemia. Books, diet and treatment plans were everywhere. Since low blood sugar symptoms are numerous, patients with a variety of issues thought “treating” their hypoglycemia was the ticket out of their health crisis. It rarely was. In the past few years newer fad topics include Small Intestinal Bowel Overgrowth. Patients come to our office chanting “SIBO, SIBO, SIBO”, yet wonder why treatments for SIBO have failed to improve their health (often after taking expensive antibiotics from their “Functional” M.D.) and finding their problems only getting worse. Meanwhile others continue chasing the elusive yeast route, lamenting that the “Candida” is not resolving and their health is not improving. Let’s look at the misunderstanding with Candida. Candida albicans, a member of the yeast family can be a contributing factor to health issues. Candida can produce large amounts of acetaldehyde leading to fatigue, confusion, and neurological dysfunction as well as acne, rashes, abdominal bloating, flatulence, cravings for sugar, brain fog, depression, mood swings, joint pain, aggravate autoimmune conditions, etc. Candida, however, is not a primary causal factor in disease but rather a normal inhabitant of the gastrointestinal tract. Through competition, it limits the growth of pathogenic bacteria while being an opportunist that will take advantage of the situation when the body’s balance (homeostasis) is disrupted. When the right conditions prevail for suppressing immunity, yeast overgrows and produces adverse effects. Many books have been written on Candida albicans including The Missing Diagnosis by Orion Truss, M.D. and The Yeast Connection by William Crook, MD. These books were followed by a plethora of practitioners writing other books to capture some of the yeast hysteria that followed with the public. Radiation and chemotherapy significantly lower a patient’s vitality. Cancer Patients frequently suffered with candida overgrowth after having radiation or chemotherapy. Candida does not cause cancer but cancer and cancer treatments contribute to candida overgrowth. The yeast organism is a bystander reacting to changing conditions. It boils down to resistance…what has caused body resistance to lower and what is required to restore it? Antibiotic Usage leading to a reduction ins bacterial competitors that keep candida in check. Diets rich in processed, refined foods, sugars and alcohol all lacking in needed macro and micronutrients. Long term emotional stressors. e.g. divorce/marital and other familiar discord, financial problems, unhappy work place, death or illness in the family, etc. Lack of sufficient sleep and rest. Underlying disease processes that lower immune resistance. Treating Candida with Nystatin, Nizoral and Diflucan will not produce the results patients seek (on the contrary Nizoral and Diflucan are very toxic with a multitude of side effects). Yeast, like SIBO, is a symptom of impaired health not a cause of it. Yeast overgrowth is a consequence of etiological factors that must be identified and thoroughly addressed in order to regain health. Yeast is an opportunist but essentially it is an innocent bystander. This requires some diligent detective work to make sure the patient is aiming in the right direction and not barking up the wrong tree. If we are not headed in the right direction addressing real causal factors than no matter how hard we try we are not going to obtain good results. Yeast treatments lead us down a primrose path that does not lead to the restoration of health. Want to get rid of your yeast and restore your health? Seek out and address causes. Create the right conditions for health to flourish. Then, with perseverance and patience, watch your health return. Just as with SIBO, Yeast is not your primary problem. Another Successful Reversal of Rheumatoid Arthritis! Ms. Campian originally came to the Goldberg Clinic for Chronic Disease Reversal from Bloomfield Hills, Michigan in January of 2018 with the medical diagnosis of Rheumatoid Arthritis and Psoriatic Arthritis. Her condition was severe enough that at the Atlanta Airport she needed to be transported in a wheelchair. Now in January 2019, one year later, she is not only walking without discomfort but also exercising three times per week with her twenty-year-old daughter! Overall Ms. Campian reports a “90% improvement” in her condition. As seen in her laboratory work, Cynthia’s initial HsCRP (High Sensitivity Cardiac Reactive Protein), an important inflammation marker, was at 5.5 initially, significantly elevated. Now, without any medications it is at a very healthy 0.6. (See lab result before and after below). Of particular interest is that Ms. Campian was taking, like many women that we see,“Bio-Identical Hormones” prescribed by her gynecologist. These led to a metabolic imbalance with her as it does with many women. Our laboratory testing revealed that the “Bio-identical Hormones she was taking were increasing her risk of developing an estrogen dependent cancer e.g. breast cancer, ovarian cancer, uterine cancer and cervical cancer. Prescribing “Bio-Identical Hormones” is a highly promoted fad by a growing number of medical physicians seeking to attract new patients with the allure of supposedly feeling younger by taking hormones (primarily physicians promoting themselves with titles such as “integrative, alternative, functional or complimentary”). We view this as a dangerous and illusionary practice that carries with it significant risks which we believe will become increasingly clear to the public over time. See article on Bio-Identical Hormones: Click Here. Part of Ms. Campian's recovery, as she describes in the video, was getting off the hormones. Utilizing the individualized BioHygienic Program™ developed for her, she regained homeostasis (balance). She now enjoys good health and the Rheumatoid Arthritis is no longer the bane of her existence. This new lease on life is happening without taking hormones or other dangerous drugs employed by physicians for Rheumatoid Arthritis and other autoimmune conditions patients come to our clinic diagnosed with. Our congratulations to Ms. Campian for her discipline in following the program we developed for her and regaining her health…real health from the inside out which Cynthia, like so many of our other patients, now has control over. How much better to enjoy each day engaging in worthwhile activities and no longer making ongoing, lifetime visits to physicians offices with their dangerous pills, potions and injections. For those labeled with a “chronic disease” such as Rheumatoid Arthritis, taking an individualized BioHygienic Approach™ and doing the hard work necessary can lead them away from a life of disease to an active, fulfilling life of independence and freedom. 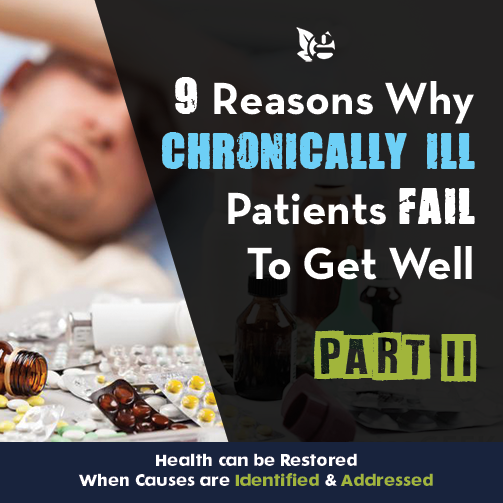 Part One of this series addressed why taking a Medical Approach, whether Conventional Medical, Alternative Medical or Functional Medical, is the leading reason patients with chronic disease conditions fail to recover their health. Part II explores eight additional reasons. Avoiding these errors dramatically increases the opportunity for “chronically ill” patients to improve their condition. For over forty years, The Goldberg Clinic has utilized an individualized, Bio-Hygienic Approach™ resulting in a high success rate reversing the chronic diseases of thousands of patients with medically diagnosed, chronic disease conditions. The Clinic’s website (www.goldbergclinic.com) presents over one hundred case histories with patient interviews and accompanying laboratory studies, documenting recoveries from Rheumatoid Arthritis, Ankylosing Spondylitis, Psoriasis, Psoriatic Arthritis, Ulcerative Colitis, Crohn’s Disease, Gastric Ulcers, Diabetes, Hashimoto’s Disease, Eosinophilic Esophagitis, Chronic Allergies and a myriad of other chronic conditions along with functional issues such as Chronic Fatigue Syndrome, Irritable Bowel Syndrome and Fibromyalgia. Many of these patients had suffered for years, even decades, prior to seeing us. Those on the website represent only a fraction of the patients who have reversed their chronic diseases by employing a causal centered Bio-Hygienic Approach™. The question remains, however, as to why some patients, even some of those coming to consult with us, fail in their quest to regain their health. Understanding common reasons as given below, can help you or someone you know avoid making the same mistakes. The Patient Takes a Medical Approach Whether Conventional, Alternative or Functional Medicine. The Individual Identifies with an Alternative Disease Symptom as Being the Cause of Their Issues. In the 1970’s, it was Hypoglycemia. In the 1980’s and 1990s it was Candida. In the 21st century it has been gluten intolerance, SIBO, Food Allergies, Dysbiosis, Leaky Gut and other popular titles patients attach themselves to. Unfortunately, many alternative practices do the same and are happy to cater to patients with these symptoms. None of these symptoms, however, cause chronic disease and addressing them alone will not reverse chronic disease. It is the causal factors behind these symptoms that are responsible and these are the factors that need to be identified and addressed for successful chronic disease reversal. The Patient Believes that Medical Evaluations will Uncover the Factors Behind Their Disease. Undergoing costly and often dangerous medical evaluations including CT scans, endoscopies, colonoscopies, biopsies, mammograms and other medical tests reveal the effects of disease rather than its causes. Many of our patients have had numerous visits to “specialists” and seen a succession of alternative/ functional/integrative/complimentary medical practitioners. They have been to “the best specialists in their fields” and arrive at our office with binders full of medical notes. The patient believes they have been thoroughly evaluated. The contrary is usually the case. The more medical and alternative practitioners seen and the more treatments undergone, the farther the patient has usually gone from the shores of recovery. Treatment after treatment presents us with knots that must be untied for we must investigate not only the original causal factors of their disease but also what additional mischief has resulted from medical, alternative medical and functional medical “treatments” that have compounded the complexity of the patient’s problems. An adequate investigation requires a causal based perspective, understanding the highly individual nature of each person. The first step is a lengthy (one to two hour) interview utilizing a Clinical Epidemiological/Bio-Hygienic Approach™. Why a one to two hour interview? We must know not just the patient sitting before us today but all that went into the patient that then resulted in disease over their entire life﻿. We are not so much interested in knowing about the medical description of the “disease” but about the patient having the disease. This takes time, understanding the life story of the patient and the details that have affected them. A physical examination and the right laboratory studies by proficient laboratories are then employed. Lab Tests must be current and interpreted from a different perspective than that of the Medical Matrix. The Patient Fails to Understand the Nature of Symptoms and the Process of Healing. Recovering from a chronic condition complicated by medical meddling requires addressing the damage done by prior treatments, breaking down old diseased tissues (catabolism) and rebuilding new healthier ones (anabolism). We refer to this process as Re-Creation™. The patient must understand the symptoms the body expresses as it is afforded the opportunity to evolve into health. It takes time for the body to undergo its re-creative work (see article The Time Factor In Recovery). In our instant relief world patients may fail to give the healing process the requisite time. New symptoms or temporary exacerbations of old ones are often part of the process of the body evolving out of chronic disease and emerging into a higher state of health. It is important to understand and trust the process of getting well. The Patient Fails to Give Up Old Behaviors. Many patients say they “really want to get well”…but lack the will to implement necessary changes. They look for excuses to continue old disease producing habits yet expect different results. Wanting to get well and exerting the will to get well are not the same. It is comparable to the person who really, really wants to be financially well off but is unwilling to acquire the needed skills and do the hard work required to earn it. Evolving out of chronic illness takes effort and right actions. Old disease creating habits must be left behind and health-promoting habits acquired. The Patient Remains With One Foot in The Medical Matrix. Some patients want to follow our instructions while hedging their bets and continuing to pursue programs of medical and alternative medical practitioners as well. They falsely believe that the more different treatments received the greater their chance for success. This commonly entails fear in leaving the Medical Matrix behind. Some patients find it difficult to give up taking pills and potions for their problems whether from a medical, alternative medical or functional medical practitioner. They cannot resist trying new fads they find on the Internet (see article on “Dr. Google"). This dooms the patient to confusion and failure. Multiple cooks in the kitchen (particularly when using the wrong ingredients) will ruin any dish. This is also commonly seen with Alternative/Functional Medical Practitioners and “health coaches” who advise patients to remain on pharmaceuticals while loading them with “alternative” medications. 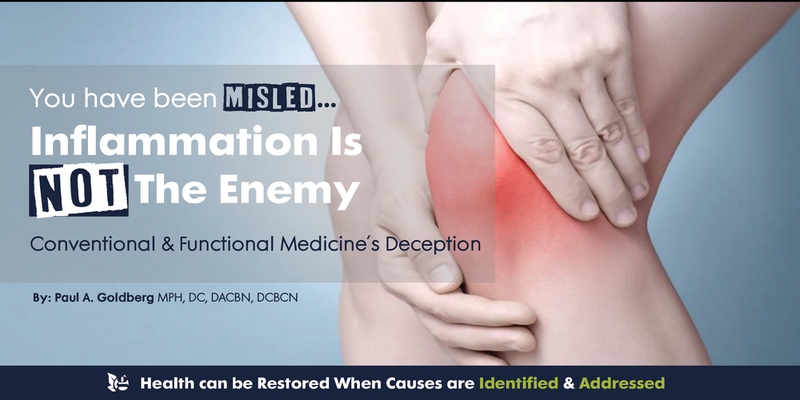 Irrational notions such as the idea that inflammation is the cause of a patient’s disease (rather than the effect of their disease) and that the patient needs to take drugs to suppress it to keep it from spreading, shows a fundamental misunderstanding that leads patients into an ongoing quagmire. Focusing On Only One Element of a Health Reform Program. To regain health from chronic disease requires identification of causes and addressing them through a comprehensive plan of action. Often times patients will cherry pick a health plan focusing on just one element rather than the entire program. Most commonly this will be the diet, which some patients focus on obsessively while ignoring other important recommendations. Good health does not come only out of what we ingest. Focusing on food alone or any other single element of a program while ignoring others is an invitation to failure. ﻿The Patient Bargains as to What They Will or Will Not Do. Some patients bargain as to what they will or will not do. It is as if we can give them permission to break the laws of nature and not suffer the consequences. They won’t follow all diet recommendations because they just have to have bread, hot sauce (or other item) but will exercise a lot. They won’t give up coffee or marijuana but will be careful about not taking alcohol. They won’t go to bed before midnight but will get sunlight. They want to stay on “Bio-identical” Hormones prescribed by their functional medical doctor but they will take extra Vitamin C.
A variant of such excuses, is to tell us they have not been following their plan but it was because they had a good reason for not doing so e.g. they had family over, or they had to go to a business banquet or they had to stay up late for a few days for a charitable event. The notion is that they should not suffer any ill health effect from the violation of their plan because it was for a good cause. We, however, are not in a position to bargain with nature. We do not make up biological laws and cannot circumvent nature simply because the patient contends it was for a good reason. Nature’s laws cannot be violated without consequences. Having a “Doctor” before our names does not give us power to intercede for forgiveness from Nature for harmful behaviors…regardless of the reasons. Failing to Have The Will to Get Well. A Bio-Hygienic Approach™…the path of causal identification, addressing those causes, creating the conditions for health to evolve and persevering through rough times as the body overcomes chronic disease, requires hard work, time, discipline and the Will To Get Well. Taking a passive, half hearted, approach to reversing chronic disease will not yield success. We must enter into the battle with not just the intent to get well but also the will to do so. We must give up all destructive habits and take the needed steps with perseverance to create the right conditions to recover our health. Avoiding all the above pitfalls allows the opportunity for a positive outcome. The reward? Good health, a high state of vitality and enjoyment of life. It is well worth the effort.